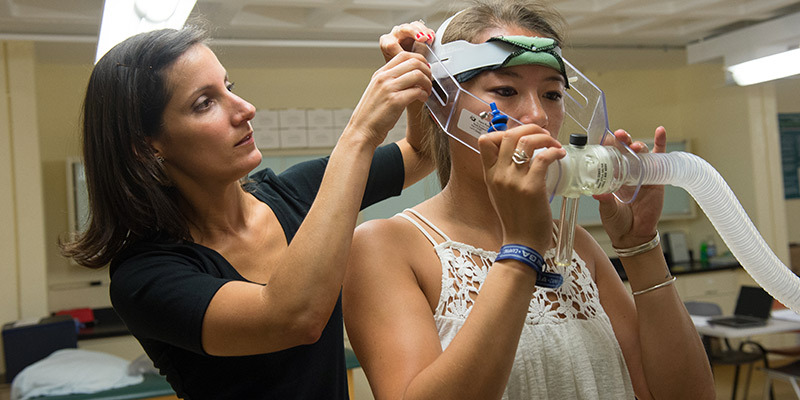 The weight management program run by Connie Tompkins, assistant professor of exercise physiology, has produced similar results for other adolescents who have completed the program over the past three years. On average, they lost about four percent body fat and gained about four pounds of muscle — a significant exchange of body mass that transforms the way participants look and feel. In one case, a teenager who was seeing an endocrinologist lost 8.5 pounds of fat and gained 8.5 pounds of muscle despite his weight essentially staying the same. “When he went back to the endocrinologist, he was told he didn’t have to come back anymore because he was no longer pre-diabetic,” says Tompkins, who submitted her findings to the American College of Sports Medicine and has a forthcoming paper on the topic. Tompkins, who has conducted similar school-based, physical activity interventions in elementary and middle schools, intentionally keeps the program simple and relies on established weight loss practices, such as caloric intake as part of a healthy overall nutritional plan and exercise regime. She also relies on current research in the field including her own to inform her practice and improve the program. Her most recent article in the Journal of Physical Activity and Health, “Heart Rate and Perceived Exertion in Healthy Weight and Obese Children During a Self-Selected, Physical Activity Program,” revealed that healthy weight and obese children showed no differences in how hard they felt like they were working — or in their actual heart rate — while engaging in fun or non-structured exercises. “We hypothesized that this was likely due to the design of the program, which lets kids engage in free play rather than making it a structured program, so that’s something that I’m incorporating into the weight management program,” says Tompkins. In another article, Tompkins wrote about how substituting dietary monounsaturated fat for saturated fat is associated with increased daily physical activity and resting energy expenditure and with changes in mood. “The goal is to continue to use the data from the program to modify it and help as many kids as possible. If it can help even just one child then it’s worth it to me,” she says. When participants start the program they have an average body fat of 44.7 percent ranging from 36.3 to 54.7 percent, with about 35 percent meeting the criteria for having a food addiction. They attend an initial intake meeting that involves a questionnaire, physical fitness test, a DEXA test to measure body composition, and an analysis of nutritional habits. Based on these results, a 12-week plan is developed with participants required to keep daily food records and exercise logs that are shared at weekly meetings with Tompkins, exercise science students and graduate students in the Master of Science in Dietetcis (MSD) program, and dietician Amy Nickerson (senior lecturer and director of the MSD program) at UVM’s Physical Activity and Wellness Laboratory. When participants finish (63 percent have made it through so far) they show significant improvement in a wide range of key areas. Preliminary data has shown decreases in BMI, blood pressure, and resting heart rate; significant increases in overall body weight due to increases in lean muscle mass and a decrease in fat; increases in physical health-related quality of life (HRQOL); increases in VO2max (cardiorespiratory fitness); decreases in citrus fruit/citrus juice consumption; increases in the use of the nutrition food labels leading to better eating habits; and an increase in various levels of physical activity. One of the most challenging problems of the program, which has filled a void following the closing of a similar program at Fletcher Allen Health Care, is keeping participants on track between weekly meetings. Tompkins sends friendly reminder texts, but that has been only moderately effective. That changed after she received a call from one of her former students, Eben Pratt ’14, who recently launched Stern/Force Technologies along with fellow alums Joshua Barry ‘14, who studied computer engineering at UVM, Jenna Bushor ’14 and current senior Tyler Sawyer. If interested in participating in the spring 2015 cohort of the weight management program, contact Connie Tompkins.